The Story: It’s Christmas Eve and for many of us this means going to bed positively brimming with nervous excitement about what tomorrow will bring. Have we been good this year? I hope so since there’s a new copy of Jansson’s The Moomins and the Great Flood that I am hoping to unwrap on Christmas morning. Yet spare a thought for poor old Father Christmas. Whilst we’re snuggled up in bed, he’s out there, battling the elements to ensure that we all wake up happy and joyous. As he flies against the biting wind and rain, sleet and hail we should forgive him if he ever comes across as a tad curmudgeonly. Raymond Brigg’s wonderful graphic novel/picturebook tells the story of Christmas from Father Christmas’ point of view in all its brazen honesty. We watch as he goes about his day to day chores before setting off on his task of delivering presents to everyone. Far removed from the jovial and amply rotund Father Christmas of Christmas card fame, here we have a grumpy, tired yet immensely lovable rogue of a character who begrudgingly goes about the task that he is beholden to. I read this book when I was a young lad, having stumbled across it in the library. I’d already found Briggs’ Fungus the Bogeyman and although the words were too difficult for me, the pictures were so rich and original that I would study them for hours. So when I found that here was another book by the same author with even less words yet equally engaging, I was in. I have read Briggs’ Father Christmas many times now and each time I return, I spot something new. The first time I read it, I was upset that Father Christmas was such a grumpy old man and wanted him to be that jolly, huggable fellow that western culture had created. But as I grew up, I began to feel some empathy for the poor man and found that his gruff exterior yet obvious love and warmth that he carries within him made him more real and therefore more lovable than the two-dimensional one I had adored at an earlier age. It is not only Briggs’ protagonist that makes this a favourite, but his stylistic choices too. What would seem mundane in prose (Father Christmas getting dressed) is captivating in pictures. 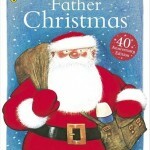 I love how Briggs is so aware of the playful format of the picturebook (a lovely example of this is Father Christmas flying across the page in different weather conditions) and can share with us small, multiple frames to show snippets of Father Christmas’ day or great, sweeping frames to stop us in our tracks to take pause in breath in the great silence as he delivers presents. There are so many to choose from but my favourite has always been, as a child, Father Christmas sat in the privy grumbling: ‘I HATE WINTER!’ There is so much humour in this scene. He might come across as a grumpy old man but in this personal moment, it’s the cat resting upon his broad shoulders that show a warm and deeply caring side to this man. This image of him squatting in frustration and annoyance at the long night ahead makes him as real as you and me. I’m Senior Lecturer in English and Children’s Literature at Oxford Brookes University. I have recently come out of teaching (for 16 years) as an Assistant Head and now work in the Education department here at Brookes as well as the Undergraduate Modular Programme and the Masters. I completed my Masters Degree at Roehampton University having written a fairy tale based in North Korea for my dissertation. The Moomins and the Great Flood. This has recently been republished and I would love to own a newer copy and dive back into Jansson’s world.